Our aging NAS setup based on a Linux NFS system needed to be replaced. After extensive research of the traditional fibre-channel and iSCSI solutions, we elected to go with the flexibility of Coraid's ATA over Ethernet (AOE). Our Coraid SR1520, SR2421, and SRX3200 storage shelves sit on a private LAN, providing AoE LUNs to servers across the enterprise. Most servers make use of raw AoE LUNs directly. 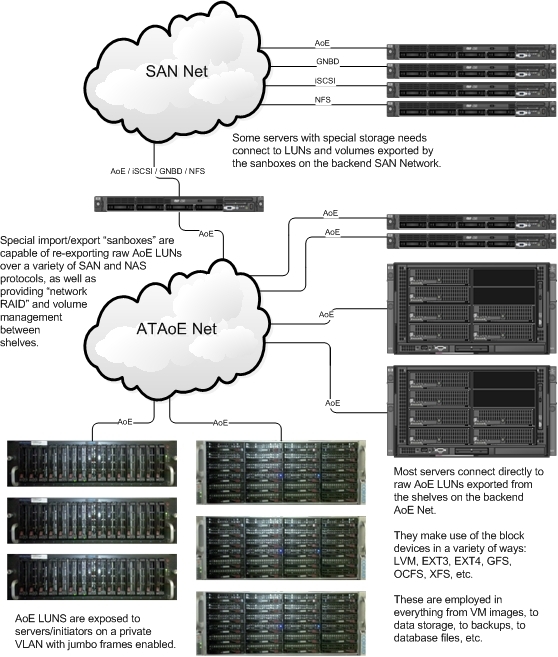 For some special storage needs, volumes are wrapped up into a Linux "sanbox" appliance that can manage, aggregate, and re-export storage over a variety of protocols. "Network RAID" is also possible, mirroring data between shelves. We have run the gamut of Coraid devices: SR1520, SR1521, SR2421, SRX3200.